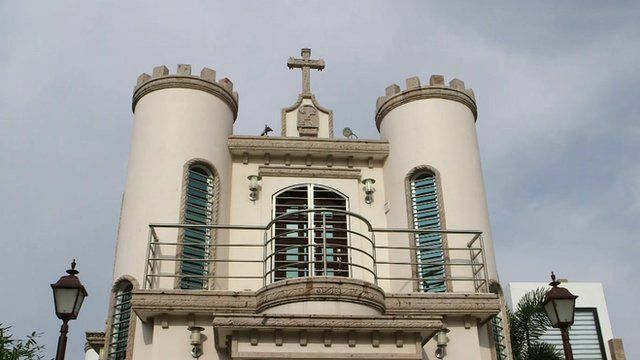 A chapel to honour El Chapo? Jump to media player Residents of El Chapo's home state, Sinaloa, revere the drug capo despite his violent history. Escaped drug lord hunted in Mexico Jump to media player A manhunt is on after a notorious drug lord, known as El Chapo or Shorty, escaped from prison in Mexico. Inside US-Mexico border 'drug tunnel' Jump to media player Security forces in Mexico have discovered an underground tunnel leading to the United States. CCTV shows drug lord's prison escape Jump to media player CCTV footage shows the moment the Mexican drug lord Joaquin Guzman escaped from prison through a tunnel dug in his cell. Manhunt for escaped Mexican drug lord Jump to media player The Mexican President, Enrique Pena Nieto, says he has faith that the security forces will recapture one of the world's most powerful drug lords, Joaquin Guzman, who has escaped from a high security prison. Inside Mexican cartel's stronghold Jump to media player Many in Mexico's Apatzingan fear the town will become the main focus of fighting between vigilantes and the Knights Templar drug cartel, as Will Grant reports. A month ago, Joaquin "El Chapo" Guzman, the world's most notorious drugs lord, escaped from Mexico's highest-security prison through a mile-long tunnel. In his home state of Sinaloa, there's a certain pride about the infamous capo, despite the violent crimes his cartel has committed. Some people say he should be honoured with a monument or chapel. Katy Watson reports from Sinaloa, the cradle of Mexico's drug-trafficking industry.